It's time for the first 'Review Award' which goes to Rhoda's delightfully titled 'Living to Please God'. Why does she get the first of these? Because she sparked the idea recently so she deserves it! 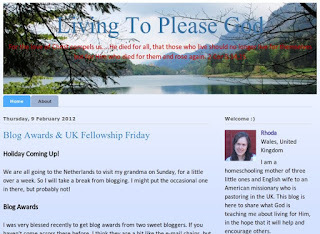 Rhoda lives in Wales and has a blog called 'Living to Please God'. Her husband is an American missionary leading a local church; they have a young family that Rhoda is home-schooling. That must be quite a challenge! 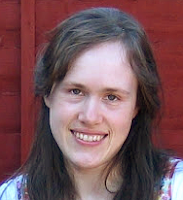 She somehow finds time to write about many things including church, family, blogging, holiness and more - but all of them are rooted and centred on Christ. Why I like the blog - That consistent Christ focus is one of the reasons I like Rhoda's writing. Another is her propensity for kindness and gentleness with her readers, even when writing on difficult or challenging topics, although she doesn't shy away from dealing with those issues. For a good example of this look at 'The dangers of questioning the Bible'. What else? Ah well, the banner image is just wonderful. It shows a serene lake surrounded by mountains, possibly somewhere in Snowdonia which just happens to be one of my favourite parts of the British Isles. Am I allowed to like a blog for its banner? Of course! And last, but by no means least, I have yet to see an article on Rhoda's blog that is not interesting and engaging. This blog is simply written, straightforward, and packed with good things. This blog is here to share what God is teaching me about living for Him, in the hope that it will help and encourage others. This simple statement sums it up, really. This is what 'Living to please God' is all about, and it's what Rhoda herself is all about. If we can't engage in ordinary, messy life and take Jesus there with us, we have failed to follow him as we should. Conclusion - Jesus didn't call us to fine theological discourse or endless argument over small details, he left those things to the scribes and pharisees. Instead he healed the sick, threw out demons, and made life better for ordinary people. He even provided wine for a wedding when it ran short. He covers our poor planning and our lack of resources in all that we do. He is - basically - a hero in every possible way. If he's our hero what else should we do but learn to live for him, hoping to help and encourage others? If that is your goal you will find abundant hints and help in Rhoda's blog.